These items are not bound by traditional concepts and ideas and can embrace free-flowing design ideas that create uniquely beautiful items. With various forms of costume jewellery available, there is no dearth of choices in the market. But we will list out a few special items that will help you to craft your look in the most fashionable way, be it a formal occasion or a casual one. This is one design that has been around for a long time in Indian culture and is still very popular among the royal families. If you are looking for something gorgeous and heavy to suit the occasion, this harness can be a perfect choice. The basic form of this arrangement consists of a bangle that connects itself to a ring, but other forms of the design have evolved with time. This can be a perfect supplement to your ethnic wears and will also look great if you are planning a minimalistic look. If you are going sleeveless, this piece of costume jewellery can add an exquisite touch to your look. The armlet is available in various designs and forms, and you can pick one to match the occasion. One big advantage of this piece is that it can be crafted in both traditional and contemporary designs making it a versatile piece of jewellery to match your shapely arms perfectly. Be it a wedding or a family function or a cultural event, and this piece will make you shine through all of them. From the hands, we go down to the feet and look at the humble but striking, toe ring. This again is a traditional item for women in India and will nicely match your ethnic dresses. A floral pattern coming with a touch of gold or silver creates a timeless beauty and puts a new shine on the overall look. They are further embellished with colourful semi-precious stones to make them more appealing visually. Make sure that you choose the right type of footwear with a toe ring so that it stands out in its full glory. This is a very attractive fashion accessory for girls, and it carries with it a sense of tradition and glamour like few other items. Though it comes from an ancient tradition, it is not necessary for the design to be old-fashioned. Modern designs with a bold touch and fascinating colour combinations can add the right touch of joy to your feet. It matches well with an ethnic dress but will also blend in perfectly with semi-ethnic ones. Last but not least, we come to the ubiquitous earring. This is one piece of jewellery that comes in many forms and varieties and can match any dress pattern with perfection. From stud earrings, to chandelier earrings and further to the hoop earrings, you can always pick a new style each time you move out shopping. From small one hugging the earlobes to the ones hanging like drops of water, the right pair of earrings will complement every dress and style to perfection. Return Man - Play return man 3 games - Free Return Man game online. 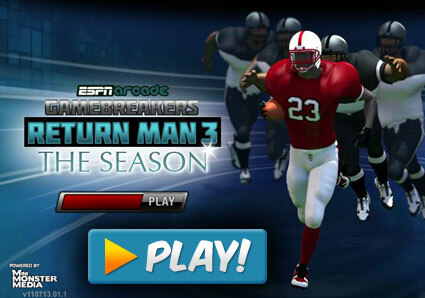 Best ESPN Game about American football, play now! This harness can be a perfect preference. The primary shape of this arrangement consists of a bangle that connects itself to a ring. Though Custom Homework Service Pro Homework Help it comes from an historic way of life it is not necessary for the layout to be old-fashioned. A floral sample coming with a hint of gold or silver creates a undying splendor and places a new shine on the general appearance.